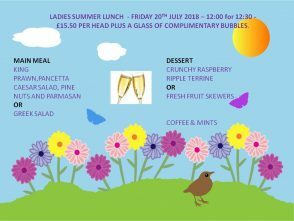 I am pleased to confirm the details for the planned Ladies Lunch on Friday the 20th July, 2018. Time: 12.00 noon for 12;30 start. Price: £15.50 per head to include a complimentary glass of Fizz. Contact Lisa or Sharon at the Club for further information or pop in to make a booking.